But, let's look at this a little closer. What is balance, anyway? The key here is three words from the sentence above: when you feel. So, think about that... balance is all relative. And what I might feel is balance in my life probably won't feel balanced to you in yours. Because, REALLY... TRULY... "work/life balance" can be what ever the eff you want it to be. Here is something to consider: throughout your life, you will have pivotal moments that will shift your focus to new or different things. During those moments, your priorities will change and so will your definition of balance. And that is a thousand percent okay. It's normal, and it's good. If our priorities always stayed the same, we would never grow and learn and become even better humans. Change brings about progress in our lives, and it also alters how we live and work and interact in every aspect. So slow down and maybe take a moment to self reflect and think about your current season of life. Maybe you're in school and more of your focus will be directed towards graduating. Or maybe you are trying to start a family, or you're saving to buy a home, or maybe you're in a season of personal growth and your business is a catalyst to bring about a much needed change in your life. Look, no amount of weight in work or in your life will create an unbalanced atmosphere for yourself unless, you're focusing your energy on things that do not matter to you. So, don't let any self-help book, article online, or family member tell you how to create a balance that only you can create. While creating a balance that fulfills you is the most important thing, you may want to re-evaluate your business if you are constantly feeling a pull to spend more time away from it. Because, the truth is that if you are working yourself to the point that you are literally burnt out at the end of each day, you’re just not passionate enough about your business, point blank. This is when you should revisit your why and maybe tweak it to better reflect your passions. Because, as we grow and progress in our lives, our priorities evolve. So, if when you first started your business you were hellbent on just getting out of that 9-5 and you were willing to do anything to work for yourself, that may not be enough of a driving force now that you are making a living outside of the office. So re-evaluate and dig a little deeper. Discover a deeper, more meaningful why that reflects your passions as they stand today. You just might find that this mindset shift makes all the difference in making you feel more balanced in your work and in your life. All in all, don't put so much pressure on yourself to create the perfect balance between work and life. Your definition of balance will not be the same as the person next to you, and that's okay because we all lead different lives with different priorities. The most important thing is that you are living a life that satisfies you and your passions to serve the world in the best ways that you can. Today is step one. Tomorrow is the next. But each day will only fulfill you as much as you let it. So, take today and set some solid goals for yourself and for your business and then act on those wants and desires one step at a time. That will create your own kind of balance- one that will motivate and cater to your individual life story. Did you love the content you just devoured!? If you did, make sure you get more of it! Join the totally FREE Lady and Company Community! 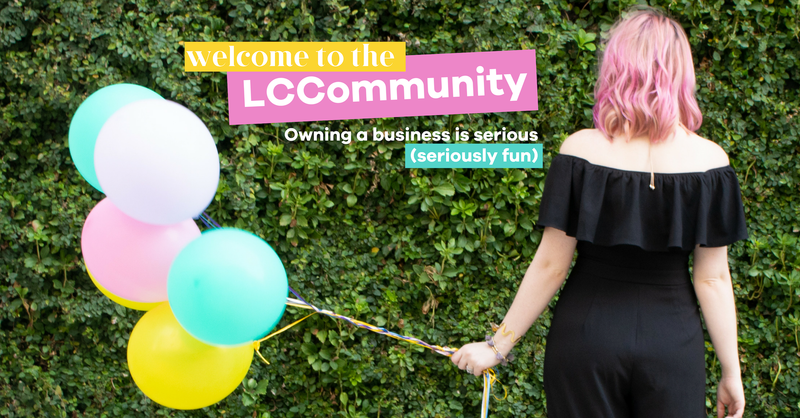 Join the free LCCommunity of Facebook!